In high school, I read everything I could find on Vietnam. Something about guerrilla warfare and military history always interested me and still does, so getting to read Michael Duffy's memoir was quite interesting. It gives the reader a unique chance to get the point of view from an officer's perspective in the field, something rather rare. “From Chicago to Vietnam: A Memoir of War” chronologically follows the author’s experience from the day he sets foot in Vietnam until he arrives at Colorado College, a veteran ready to start school. Michael Duffy's writing style is solid though it suffers slightly from a “that, this, then that” style often favored by military writers. This is not a significant issue and even with it, Duffy's ability to take small moments and make the reader connect with them is no small feat and makes the book worth reading for anyone looking to get a glimpse into the Vietnam War and the military experiences of the time. The important thing to keep in mind is that this is a memoir and it very much reads like one. If you are looking for something with more of a plot or storyline in the background then this is probably not the story for you. 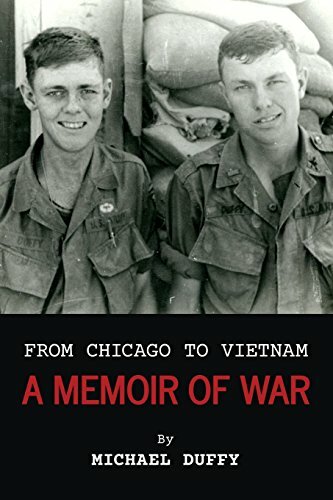 “From Chicago to Vietnam” is more like a well-written journal than an actual story. This does not make it any less interesting to read, although at some point I began to ask myself why the author's experience in Vietnam was any more important than anyone else's. This is the one question the book never really answers, and I spent much of the first several chapters waiting for the author to connect himself with some specific event or memorable moment in the war. Unfortunately, this never happened and I think if it had it would have really made a huge impact on the book overall. In the end, Micheal Duffy's “From Chicago to Vietnam: A Memoir of War” is exactly what it claims to be. Though Duffy's writing connects with the reader and draws you into the experience, it is lacking any connecting plot or theme, other than the Vietnam War. Don't get me wrong—I liked this book—I just wanted to like it more. “From Chicago to Vietnam” is an example of what happens when you try to make up for lack of plot with excellent writing and some really interesting highlights. With that being said, the book is still worth reading for anyone interested in the Vietnam War and the experiences of the soldiers who were there. I personally really enjoyed being able to get into the head of a young, non-career officer. Usually when we read from the perspectives of officers, it's those famous ones who have retired as old men and made a name for themselves in war. This book has a very different and perhaps more valuable insight. At the very least, it is a much rarer one. I give the book four out of five stars, as it is a meaningful work that is exactly what it claims to be.